Are You Ready To Start Drinking at Breakfast!?! Everything you love on a breakfast menu—bacon, blueberry pancakes and glazed donuts—is now in a bottle, and packing a 70-proof punch. 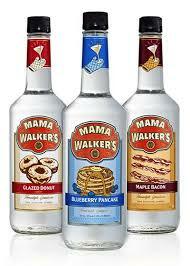 Pernod Ricard has launched a new line of breakfast-inspired liqueurs under the Mama Walker’s brand to take advantage of the rising popularity of flavored spirits. “Consumers now are really flavor-seeking. Liqueurs have always been a flavor-driven category, but now so many other categories are involved with that as well,” said Juli Falkoff, brand director for Mama Walker’s at Pernod Ricard. Consumers’ hunger for fresh experiences puts constant pressure on producers to launch new drinks. Pernod’s classic liqueur Hiram Walker has been innovating with flavored spirits for years, with flavors such as whipped cream, watermelon and pumpkin spice, but the company opted for to create a new brand Mama Walker’s to project a retro feel and flavors that push the boundaries.